Wednesday is Finn's fourth birthday. That's ridiculous. It seems like only yesterday that he was a baby, throwing up in my mouth. And now, here we are, four years later and he's a fully formed kid, throwing up in my lap. It wasn't really his fault that he threw up on me this time. The flight back from Key West was really bumpy and people all over the plane were blowing chunks. Did you guys know that they don't stock air sickness bags in each seat pocket on airplanes? I didn't. I do now. By the end of the second flight, my Spidey sense was so in tune with his stomach that I didn't even need to look over - I had a bag ready without losing my place in my book. Shame I didn't develop that skill on the first flight. So after a week that included the turbulence-induced vomitting, as well as an overly-tired-induced "night terror" attack, it was time for some birthday party fun to lighten the mood. Finn really wanted a Star Wars themed party, so Kitty and I did some digging online and quickly determined that we couldn't have a REAL Star Wars party without pool noodle lightsabers. Of course, we're not the only ones that think they're cool. 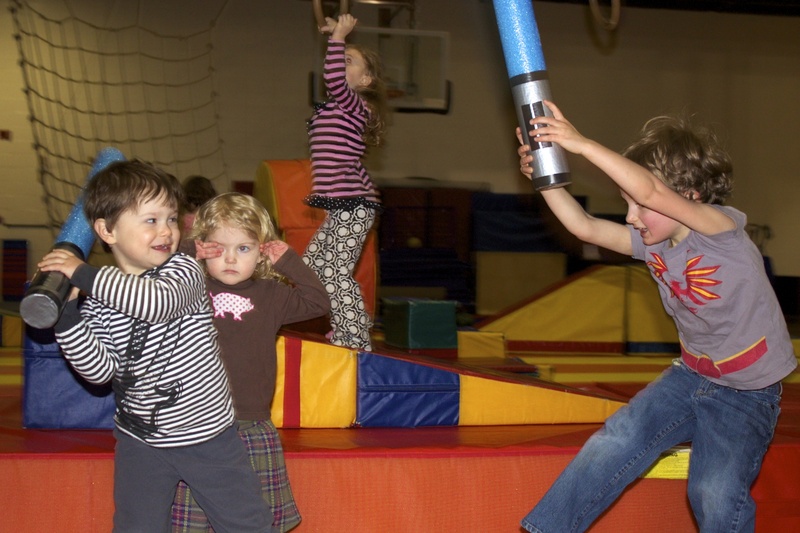 Turns out pool noodle lightsabers are a huge hit with four year olds - and their faces. Luckily, despite each and every kid's very best efforts at taking each others' heads off, there was only superficial damage done. Which was good, given the extremely skeptical looks the folks at the YMCA gave us when we rolled into their gym with a box of 15 of these kid-killers. By the end, even they were recommending these as a party favor. If you decided to totally copy us and steal this idea, one word of caution, thief: apparently March is not a great time to buy pool noodles in the Pacific Northwest. Weird. Since we couldn't find them locally, I had to go online, where we had to acquire a case of twenty even though we were only going to use 7 of them for the party. Given that we live in Seattle, with roughly 4 pool days per year, I'm hoping to put the extras to good use in the bathtub. I can probably only squeeze about 4-5 of them in the tub at a time, so let me know if any of you are in the market for some noodles. I'll sell them to you cheap-like. Or perhaps trade them for some extra air sickness bags. You can never have enough of those things. 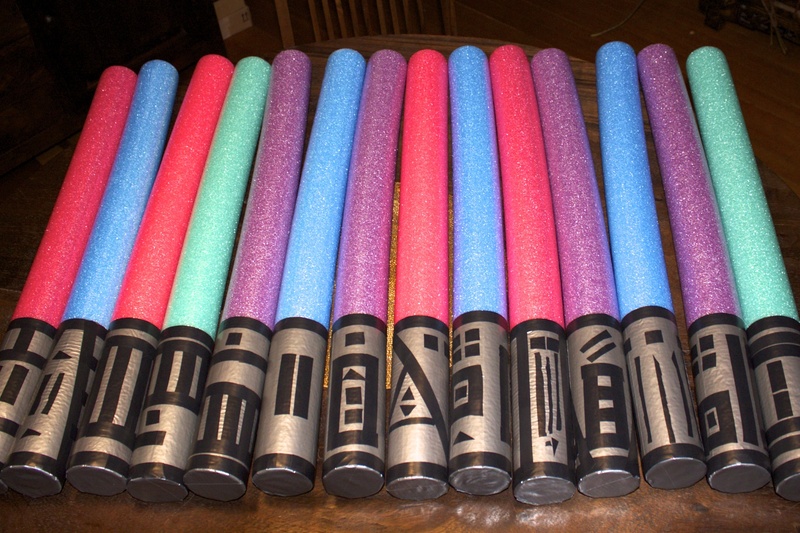 I am looking for pool noodles to make lightsabers for my son's indoor pool party coming up and am having no luck finding them. If you still have your extras I would be very interested in buying them ASAP! Oh, I've got extras. Are you in Seattle? What a great idea!! Your post had me in stitches too! Love your sense of humor. I'll look at wal mart for the pool noodles.